As I've been haunted, for lack of a better word, with what I was doing one year ago tonight, I received a delightful surprise from Traci! A year ago, Shayla and I rode with Nonee and Paw Paw to the Detroit airport after school where we were delayed due to a storm. Arriving in PHL, Tim drove us to the Ronald McDonald House. During the drive I told him how much pain Christi had been in all week and that she couldn't even walk. As we pulled up in front of the Ronald House gates, much to my shock, Christi came walking out the front gate - in her slippers and pajamas and literally jumped into my arms. It goes down as one of THE GREATEST moments ever. I thought she was perhaps on her way to recovery. In fact, it was the final time I ever carried her. For whatever reason she felt so well that night; the girls played with some toys until I was so exhausted I said that they had to go to bed. I've lived to regret those words as Christi woke up, sleeping beside me, in the middle of the night with horrible leg pain and a headache. It was my last night to sleep with her in a regular bed as the next afternoon Shayne had to carry her into the emergency room for her final admittance. Soon after Christi died I realized that I, the picture lover, would never see another new photo of Christi ever again. Over the years I took great delight in viewing the (near) daily photos I'd taken right away. Last night, again awake and unable to sleep, I went to visit Harriet's "wallpaper stripping photos". Earlier she sent me the link, but I didn't view them yet. Imagine my surprise, not only to see her funny photos (She definitely had more fun ripping off wallpaper than we did, but that should come as no surprise! Traci makes everything FUN!) but I noticed a few "Christi albums". Much to my surprise and delight, there were about 40 shots of Christi I'd never seen before! I am incredibly grateful!! Back in NYC, the sweet "Christi Supporter" Olivia is conducting a book drive in memory of Christi and her love of books. She wanted to do something special on the anniversary of Christi's heavenly debut and we think it's a remarkable and very loving tribute. I was so happy to donate some books when we met in NYC and also to learn of how many others were getting involved in her project. Yes, a big blessing! While cleaning the basement recently, I managed to muster up the courage to toss out Christi's old baby blankets. I would have kept them, but there were a few stains and I've decided that I cannot keep it all. I couldn't decide if I was mourning the normal loss of childhood, or the true loss of young life. I also came across a sign made by an incredible aide at school. We hung it in her Columbus Hospital room many times in the fall of 2002. It said, "WE MISS YOU, CHRISTI". I told Shayne I feel like taking this out to her grave because we've never missed her more! It's hard to believe Labor Day has arrived. We vividly remember the last one, taking Christi down through the tunnels below CHOP to the adult hospital of UPenn for her radiation. We knew there was a serious problem when they were calling staff in on Labor Day to get radiation started on her brain. 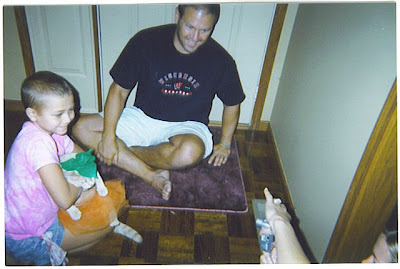 While we had to do it at the time, and always would have wondered "what if" had we not done it, they are definitely among the worst memories I have of the hell this little girl endured. She was so scared and yet would say, "I know I have to do it, mom, but I am scared." Father Joe made reference to those comments in his sermon at her funeral on September 23rd. This weekend we'll be with family and we will be trying very hard to put out of our minds what was being done to her last year as the hard metal frame held her head down and was bolted to a hard board which went up into the air. She was so frightening that she was going to fall off of that table. I was not permitted in the room with her so via an intercom, I read and sang every bible song I knew to try to comfort her and give her something familiar to try to ease her stress. It's been weird reading "Hank" books to Shayla, but she's absolutely loving them right now. She's also been growing her bangs out since May and we are proud of her for sticking with it. She's been wearing a lot of headbands to keep them out of her eyes; we think she looks beautiful. Here's wishing you and yours a fabulous weekend! Christi appears to be too busy reading her cats and kittens book she borrowed from the hospital to be examined by Dr. Maris. With her coat still on, it appears she has someplace else she needs to get too! (That was the day we took off for the museum as soon as we were "free". Thanks, dear Jenn and Traci for coming to Philly! I just wish I could remember what Dr. Maris was saying. Christi, as usual, was most likely cutting up and trying to humor him and her COSI friends - check out her expressions! What a charmer! What a hoot! On the way to the airport, her COSI friends surprised her with a surprise 9th birthday party at Magic Mountain, along I71 in Columbus. I will say that every time I drive by it now I sign with sadness; yet she had a glorious evening there and I will never forget how happy she was with her sweet COSI friends as we celebrated her life! Her first and last go-cart ride. She was too short for them to allow her; however, she stood on one of our sweet friend's shoes and I think I whispered something to the guy like, "Something is going to kill her and it's not going to be a go-cart ride; although that be a better way to go out." He gave her a ticket to ride. After one trip around the track, everyone had to stop. Poor Christi was just too short to reach the pedal and drive so the operator put an inflatable "pillow" behind her and THEN she was off! And she LOVED racing her "big" friends. Praise God for great memories and great friends! This week has been better than I expected. For the most part, I’ve been able to force myself away from reflecting upon this week last year when Christi was with Shayne out in Philadelphia and I was teaching and taking care of little Shayla. It was really Christi’s last good week before the intense pain took over and before the new tumor in her brain, discovered on Labor Day, affected her mind. I wish I would have been able to be with her; however, I was out of sick days and needed to teach. Shayla and I flew out that Friday night after school, believing we’d be flying back on Labor Day to return to work. Yesterday, after school, I returned for my fifth semester of teaching at Heidelberg. The college has their largest freshman class in forty years. That is exciting! I’m very grateful to have the opportunity to work with such wonderful experts and working in air-conditioning is most appreciated. With temps in the high 80s and a heat index of nearly 100 degrees, teaching in my middle school room this week – on the second floor of a brick building - has been very challenging physically too. I keep reminding my students that next year we will all be in an air-conditioned school and they will feel so much better. When I got home last night Shayne said, “I knew you really loved me today when you had me pick Shayla up.” I could only laugh! A friend and Heidelberg College student will be meeting me on campus and then taking Shayla while I’m teaching. 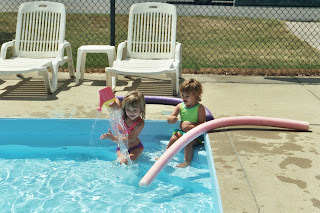 Yesterday she asked if it was ok if Shayla played on the “slip and slide” they were planning to get out at their house. Incredibly hot out, I thought that was a grand idea. I said to Shayne, “Let me guess. You got there and the six college girls that live in that house were all outside in their swimming suits.” He laughed and said, “Yes, enjoying the slip and slide.” Shayla had a ball and said she can’t wait to go to college. Imagine that! I am so pleased to share that the sweet woman, from Canada who left the card, emailed me!! “….. We got to both COSI and Cedar Point and I can’t thank Christi enough for sparing us the flooding. I had mapped out the route to the cemetery and had I not done that, we would have ended up in the flooding on the I-75! I tend to think that it was Christi who spared us this! What a sweetheart! I just wish she could have met Christi in person because her giggle was infectious and would absolutely melt your heart! You have had to hear it in person to really appreciate it. In my mind I can still hear it and I hope it never leaves my mind; I do worry that it will. Thank you, sweet Bloggers! Today was better. I thank the good Lord for that; Shayne and I sat on the couch until the early hours last night just crying and holding each other for hours. I am so thankful I am not a single parent. I know how blessed I am to have this wonderful family. I've decided two things: bloggers are too kind and ripping down wallpaper is a good stress reliever! Leave it to Christi's sweet supports to remind ME that Christi's bear was named "Vanilla" not "Cinnamon" (Cinnamon was her friend, Sarah's bear - oops!) and for another sweetheart to locate the picture I couldn't find. (see comments) That, along with a few emails I received from angels on earth telling me how Christi touched their lives really helped me cheer up after school today. School was pretty rough. And then there was the little "fender bender" that ended up having Christi written all over it. 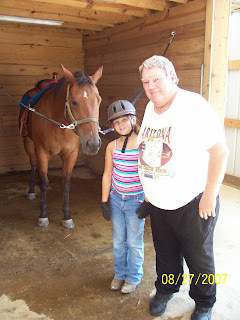 I took Shayla to her horse riding lessons after school and grandpa went along. (See picture.) He bought her new riding boots last week since she outgrew and even put a hole in her old pair (Actually, they were Christi's little riding boots from Walmart and are now in the garbage.) Then I ran into town and went to the library. When I came out there was a lady there saying, "I hit your truck. I've called the police. I'm so sorry." I could only laugh and ask her if she was ok, thinking I know what's important in life and this isn't a big deal. She said, "You're kidding. You mean I sat here and worried some big farmer was going to come out to his truck, yell at me and pull out a gun. You are so nice." I responded that I was glad she was ok, but it was my father-in-law's rental truck and I'd better call and tell him. Of course I'm thinking in my head, "Oh no, there is a HUGE dent in the side of Lowell's rental truck. I wonder if he got insurance." (Whew, he did!) The police officer was very sweet and soon Lowell, Shayne and Shayla arrived. For whatever reason I responded to Shayla with, "Miss Shayla Thomas" and the lady - who lives in another town, said "Are you Christi Thomas's family??!!" I may be terribly sad, but I was very tickled that she knew Christi too. It's a small world (that had a special little girl). Well, stressed spelled backwards is "DESSERTS!" but I figured I'd better do something healthy after dinner tonight so Shayla and I skipped dessert and took to the bathroom where we started washing and pulling down the old "country peach" flowery wallpaper that has been in our home since we moved in back in 1993. For two years I've been talking about turning our bathroom into a "NYC Theme" bathroom and we are now in the midst of it! (I'll share a picture when it's finished because everyone will want to see a bathroom, right?! hee he he heeeee!) Seriously, NYC was the city that gave us many more years with Christi and put us in touch with tremendous friends who enriched and blessed our lives in countless ways. I think it'll be a nice "subtle" tribute to Christi and to the great memories we treasure of our eight months of living in NYC and the many who helped us along the way. In the early evening, we had made the decision to get her to Philadelphia. I packed her suitcase, all the while praying that it wouldn't be the last suitcase I'd ever pack for her; yet, sadly weeks later I unpacked it with gushing tears. Carefully, I prepared the van trying to make it as comfortable for her as possible as I spread out many soft blankets which has been sent to her by loving supporters. (Father Joe included it in his sermon at her funeral.) Right before they left Christi asked me if I packed "Cinnamon" her teddy she made at Sarah's 10th birthday party in May. I didn't so she ran (much to our surprise and delight) up to her bedroom to get it. 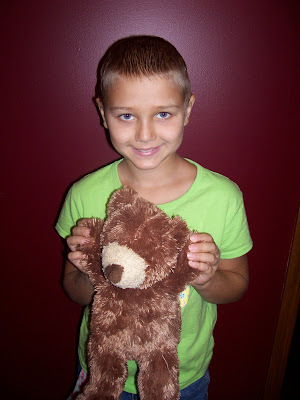 I snapped the final picture of her, holding that beloved bear we later gave to Sarah, and they were off. Shayne drove straight through the night and pulled into CHOP's parking lot about 4:30 AM. He said he put his arms behind his head because he was exhausted and fell asleep. At 7:30 Christi woke up him telling him she had to go to the bathroom. At least we can laugh about this a year later....his arms fell asleep and he couldn't get them down and struggled to get her out and inside the hospital. I believe Dr. Maris and Pat were surprised and quite saddened to see them on Monday morning. Shayla and I somehow got through that week alone, just like we WILL do this year too. Shayla is doing very well - not realizing this horrible time we are suffering through. I wish I could say that her parents were doing well. We had a nice, busy weekend getting some home improvement projects done on Friday night and a long overdue basement cleaning. (Shayne put up a beautiful backsplash in our kitchen. I'd wanted to do it for about two years and I can't believe how nice it looks. He's got a lot of talent!) Saturday we visited with his mom (She's doing great! Hopefully, she'll get the pins out and brace off in two weeks!) and his sweet aunt and uncle and grandma. Then we went to his beautiful cousin Vicki's where she had the "Thomas Party". She's quite the hostess with a large rented blow up bouncy thingy for the kids and too much good food! It was very nice to catch up with everyone. 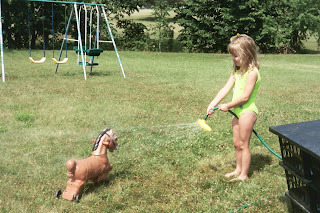 Shayla was anxious to get to Aunt Marty and Uncle Jeff's to see "Dolly" - the new horse. What a delight!! It was fun to stay over night and to get up early this morning to take Dolly out riding. Then it was off to Gambier (Home of Kenyon College) to riding on the Kokosing Gap bike trail and then back for another ride on Marty's horse. I will continue to let my mind reflect on the great weekend and try hard not to remember the hell we were enduring a year ago. I think that is best, despite the fact it's like my mind is haunting me. I apologize for the many errors I’ve probably been making in recent posts. This English teacher isn’t well, nor at her best, yet I feel so close to Christi when I write, and I miss her so and want to feel close to her, so I continue. I think it helps me heal, but the pain right now is so raw and most likely my writings have been filled with errors too. Oh, "HELLO, DOLLY!" Shayla couldn't have been any happier today. Last night, she couldn't wait to get to her great aunt (and her Godmother's) to meet Dolly, a Tennessee Walker - what a beauty! Shayla jokes with her dad on our lunch stop. So blessed to be healthy and out enjoying a great bike ride on a glorious and lovely day today in Mt. Vernon. 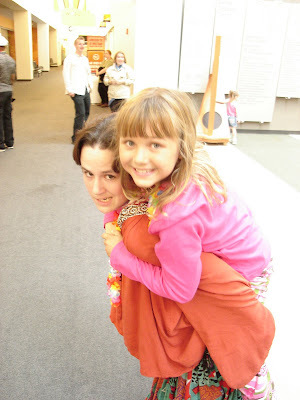 I came across this picture of Christi & Traci at COSI, one year before her death, and I just love it. They both look great; Christi in all her glory - at COSI and with Harriet, wow!! Shayla at Aunt Marty's Today. This picture reminded me so much of one snapped of Christi last summer. It was used in her funeral program booklet, but I cannot find it right now. Hmmm. I'm willing to bet I said, "Wait! One last picture before you go." I love it and am so glad I took it. She looks great here on her last minute in our home. 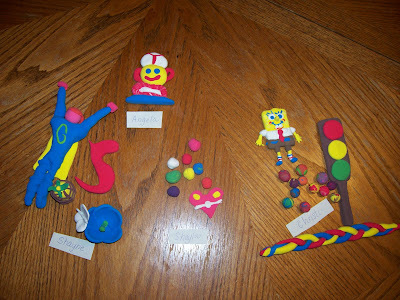 The last time we, as a "family of four" had a Model Magic night. I don't know why this showed up so small; Christi's expression is just charming. Just a little bit ago I walked out of school with great sadness. I just can't shake what I was doing one year ago today. It was the very last day Christi walked out of one of her favorite places in the whole world - her school, holding my hand and not feeling very well. She had complained that her head hurt and she was so tired. Never did I imagine she'd never go back in and that this would be her final weekend in our home. Once at home, at this time one year ago, she perked up and wrote out the play for the video/dvd she created at Aunt Marty's on Saturday - what a blessing. She gave us all roles to play and I am hopeful that somehow I will be able to get the DVD on the blog. Christi was so cute as we videoed her "getting out of her car and walking the puppies out to the pond." It was like she was a little 16 year old, driving to camp. (Ah, you have to see the DVD to appreciate it.) I'll see if there's a way to share what we captured as Christi's last final (pretty good) day. Even though we're trying to do things differently this year, we will be at Aunt Marty's tomorrow, just like we were a year ago filming the little show. It is just the way things worked out with Shayne's dad here. Shayla is most anxious about riding Aunt Marty's horse. Aunt Marty has always wanted a horse and SHE BOUGHT ONE!!!! Grandpa bought her new riding boots this week since she outgrew Christi's. Grab your loved ones and tell them why you love them! Here's wishing you and yours a great weekend! The five year old didn't look sick, did she? One of the reasons this beast is called so tricky and malicious! It spreads rapidly without warning. Only through His grace.......I made it! Just taking the pictures, first thing this morning, with one child instead of two was a killer. We put on our happy face for Shayla, but.....there was definitely not smiles on the inside. Seeing all of the sixth graders together in the gym, where I had to wait to meet my seventh grade homeroom students, was more than challenging. I kept trying not to look at them, yet I couldn't help but notice how much bigger they were. What would Christi have looked like had she had the chance to live another year? Throughout the day I tried to avoid her class so I wouldn't break down, yet some of the sweeties came over to my room and gave me hugs and told me hellos. Aren't God's people good?! Even though it about killed me, it was terribly sweet! I called Shayne at lunch only to learn he was have a most challenging day as well. We just miss her so and this was always such an exciting time - the start of school! I know things could be worse, so I will continue to tell myself that even though the lump in my throat just won't leave my body. Shayla had a great day, as an 8 year old in the third grade! Go, Shayla! First Day of School? NOT! Grandpa wanted to take the girls to school early one day that week so I left early. Grandpa snapped this photo of Shayne walking the girls in. What I wouldn't do to go back a year ago and see the smile on their faces, so happy to be back in school. I do remember this happening one other time in my nearly twenty year teaching career......This morning school was delayed and then cancelled due to the large amounts of rain and flooding in our area so we ended up at the cemetery and on the campus of BGSU! While Shayla was happy to cuddle up with daddy early this morning, I only thought that the anxiety I had been experiencing would now continue one more day. I feel like I just want to get this over with and then it will be better; however, I think next year will possibly be even more difficult because Christi really wanted me to be her 7th grade teacher and I would have loved nothing more. I think teaching her friends, and not her, will be crushing next year. First though, making it through this year. I spent the majority of the day cleaning and going through things that I'd been putting off. I finally moved Christi's purse off of the shelf, by the door, where it'd be hanging since she left it there a year ago. Going through it was so odd. I kept thinking, "You're not supposed to be going through someone else's purse!" (And - smile - also, "OK, I need to get rid of the junk in mine so that my family is not left going through it!!") Christi had a paper wallet that she made (Imagine that!). I need to take a picture of it, complete with all of the hand drawings and colored pencil colorings. She neatly has some dollar bills - perfectly arranged in it; I couldn't remove them. She was also quite a little change collector. Inside her purse she had TWO little coin purses, FILLED with coins. I caught myself from counting the money because I knew it'd just be too sad and would delay things so I put it in a little plastic bag for Shayne to take to the bank, or to include with his change. I just don't want to think each time I reach in my purse that I can't use THAT dime because it was Christi's. I must move on, no matter how hard. While leafing through her books today, I opened up one with a chapter called "My Major Problems". It asked, "When you're afraid and don't know what to do or where to turn, who are you going to call? Forget Ghostbusters!" In Christi's little handwriting is written: "When I am afraid, I will trust in You. I will call on God." So after mopping up those tears, I somehow went on - missing her desperately goes without saying. On what should have been your first day of sixth grade, you now know all the mysteries of the universe and you learned it all from the Creator Himself. No more speculation, no more theories, you know all the truth and I'm sure your brilliant mind soaked all of it in. Keep watching over your family! Shayla asked if she could wear the pin. I told her that I wanted to wear it to the first day of school tom morrow, but then we could share it after that. She said that was fine. If that sweet, sweet Canadian family would please email me (zzartset@bright.net) I would really appreciate it. Tracey, you have NO IDEA how profoundly this touched me and then soon Shayne as I called him choking away tears trying to read the card to him. For the first time I couldn't pray at Christi's gave. I had to ask Shayla to please pray for me because I just couldn't believe that someone drove to another country and actually located Christi's cemetery - not to mention her grave since her mother can't muster up the courage to select her darn plaque yet!!!! What incredible, loving kindness!! Additionally, I can't help but think we just missed you because the baggie was so clean - no rain spots, very little mud. (We were there at 2:30 this afternoon and when Shayla said, "Mom, wasn't there a brown car pulling out when we pulled in?" I remembered yes indeed there was.) Also, I wonder if this is the same sweet Canadian mom who emailed a month or so ago and inquired about what to do at COSI and Cedar Point because they were taking their summer vacation to Ohio. I didn't think too much about it, but now I actually wonder if little Christi's life inspired a family to do this. (And I really hope they had a great time; the weather hasn't been the best.) And I feel horrible that I didn't get to meet them in person and at least invite them over for lunch. We LOVE meeting new people! Shayne jokingly suggested that if this family really did do a "Christi Tour" then we could put together a bus trip or something for next summer - getting together and enjoying all of Christi's favorite places for a few days, what fun! Of course he said, "We'd need to put together three trips: One for an Ohio tour, one for a NYC tour and one for a Philly tour which will start at the US Mint!" A year ago Grandpa (Shayne's father) arrived in town. He'll again be here on Thursday for his annual visit. While we're looking forward to his visit, it also keeps reminding us of how we spent this last time together one short year ago. The beginning of her downfall. Little did I know on this day how terribly ill she was. Each day we'd come home from school and cuddle. I think this photo was on Wednesday. By Sunday, Shayne was transporting her back to Philadelphia. Conceived in Pennsylvania, died in Pennsylvania, yet she LIVED LARGE in Pennsylvania too! That is what I need to focus on. The girls saw each other, screamed and then RAN to each other and hugged. I quickly sighed relief that they didn't knock each other down, then tears pour down my face. It's amazing how Christi's journey gave us so much! Good friends!! While the girls talk on the phone, they had not seen each other since Shayne ran the NYC marathon in November of 2005! They were so cute with their comments, "You look different, yet the same - just bigger." "You're so much taller than I remembered; I guess we both are." New Yorkers get such a bad wrap. This beautiful family helped us many times when things were really tough with Christi's health by taking Shayla to their apartment after preschool and keeping her entertained while we tended to difficult challenges at the hospital and wanted to both be with Christi. People are good!! Only in NY! A "floating" pool (on a barge). Sand hauled in on a parking lot to make a "beach". Check out the NYC backdrop - amazing!! With the ABSOLUTELY AWESOME - BRILLIANT AND BEAUTIFUL Nitza, back to where these two girls first met - at the Metropolitan Museum of Art (the largest museum in the Western Hemisphere) where the girls were in a free preschool art program together Nitza taught. "Start with Art" Nitza, as always, was beyond delightful and compassionate. She kept the two girls (and all of us adults) mesmerized as she shared various parts of the museum on our "private tour". What a great friend!! Shayne was a bit late in joining us. First he went to Central Park to view "Angel" Penelope's memorial plaque, after he donated platelets at MSKCC. I knew I wasn't that brave. I sobbed as I walked to the Met by myself and walked past the "Ancient Playground" where I vividly remember Christi playing on that great playground after enjoying the art museum on many occassions. June 2005: Nitza, Shayla & Christi at "The Cloisters" - part of the Met. While Shayla was "living it up" at her friend's apartment, we had a romantic night in midtown. He bought me this beautiful white dress. We ate pasta at an Italian bistro, on a small table, at a sidewalk cafe. In Times Square, we saw a funny and delightful musical and after the show we enjoyed walking around, just taking it all in! I won't say we didn't spend some time in tears throughout the evening as we reminisced about all of the things Christi loved about "the big apple", but we did have an absolutely lovely night together. I am so blessed. Afternoon Tea on Sunday. Our beautiful friend, Olivia - who also went to MSKCC to donate blood Sunday morning, met us at the American Girl Store! It was GREAT to see her too!! What a hoot! Can you believe this? Yes, it's a "doll holder" for the bathroom. Only at the American Girl Store!! Welcome to the World Sweet Evan Thomas. Our congratulations to a very sweet couple in a neighboring town on the birth of their new baby!! This couple had their wedding dollar dance for "Christi & Alex's Lemonade Stand" in 2006 and drove the money over to Christi's stand in June. We were incredibly touched. (Dani met Christi when she was an ice skating instructor in 2004 and was very moved. She later told me how she sobbed upon learning Christi's cancer was most likely terminal.) When Dani emailed me recently that she was pregnant, she said we were going to love the name. Well, when the baby boy was given "THOMAS" as his middle name, we knew who that special name was from and we know she'll watch over him VERY carefully from Heaven above. May God richly bless him with a life full of good health and happiness! Congrats!!!! I've been without my computer for three days and I just learned of terribly sad news - Carter's death. I will write about our amazing trip with great friends in NYC, and my romantic evening with the best looking guy in NYC this weekend, but this entry is in love and honor of one amazing little guy who will forever live on in our hearts - Carter Finger. I will never forget Carter's incredible vocabulary and ability to communicate with adults. He was wise WAY BEYOND his years! Carter would actually give me his movie critques on the latest movies he had watched and even though I don't really like movies I've found myself going to the video store with Carter's recommendations in mind! 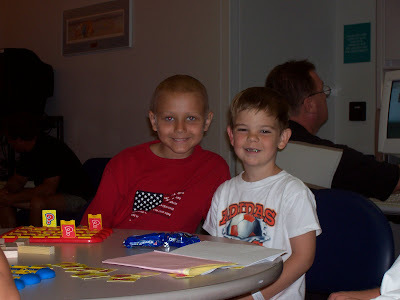 Carter treated in NYC and at CHOP and we shared many "Angel Flight" and "travel/driving situations" and had so much in common trying to beat back the horrible neuroblastoma. I pray that Christi is watching over this wonderful little guy we were all so blessed to know and love and that she's getting him around to the pets and the other little boys. It is with terrible regret that I realize I cannot possibly attending Carter's services, like his parents so lovingly did for us. (I will never forget their kindess of seeing them walk across the cemetery, knowing fully that Carter was in a Pennsylvania hospital at the time.) I started back to work today and our studnets start tomorrow so I will be teaching this week, but my heart will be in Pittsburgh with Carter's family. He also leaves behind a beautiful teenage sister. I would really appreciate your prayers for this most wonderful family. Thank you! After my class ended and I picked up Shayla at Mom and Joe's we all headed to a place I'd been trying to get to all summer - Grand Rapids, Ohio! In Grand Rapids, history comes alive! We enjoyed "The Canal Experience" where the mules walked on the towpath and pulled us down the canal, through the locks while the workers were dressed in period costumes and pretended it was 1875. Shayla enjoyed hearing that we weren't properly dressed because our ankles were showing and our heads were not covered. It was a very educational experience as we all learned about the Erie and Miami canal. Shayla was selected to hold the "thunder bucket" but she told me that if anyone got seasick she was just going to pass it to them, not hold it for them. We went went to Bowling Green for the evening. Last fall, after Christi died, we learned of Shayla's vision problem, while on a visit to San Francisco, which was affecting her reading. She worked throughout March on nightly exercises and with once a week trips to Toledo to work with a vision therapist. Thankfully, it was very successful and Shayla ended the school year reading at grade level. In May she was tested for and qualified for the gifted and talented program; however, that was cut for this school year (ergh!!!). When she was diagnosed with "excessive convergence" she was also diagnosed with a form of dyslexia called dyseidesia which causes great difficulty will spelling. We felt we needed to get her reading back up to par first and then try to tackle this spelling problem. Therefore, each week since May we've been traveling to Bowling Green where she meets with her "spelling teacher". I don't know how much it has helped, but Shayla absolutely LOVES this wonderful teacher and they both work incredibly hard for 90 straight minutes. I start back to school on Monday; therefore, we will end our final weekend of the summer in Thomas team style. Shayne will be donating platelets - at Memorial Sloan Kettering Cancer Center in NYC. Amazing, isn't he? I cannot imagine he's going to muster up the courage to donate platelets back where he did so for Christi countless times. I will not be even able to go near the hospital I'm afraid, but I am looking forward to a weekend in NYC hoping to spend time with good friends! Today, Shayla was dismissed from her "heel therapy" and we also made chocolate almond biscotti to take to our NYC friends; however, it didn't turn out near as well as the batter tasted, hmmmmmmmm. We both believe that was the best part! NEE NEE NEWS: Grandma Nee Nee has been staying with her brother. He's fixed up a little "apartment" and she's in the same town with her three brothers and her mom. We understand he's even arranged for a scooter for her and he made an incredible treasure chest for Shayla's toy box! Although she's still wearing the 35 pound "thingy" she did have the staples and pins removed and the doctor in Toledo said she's healing very well. Goooooooooooo, Nee Nee!